From Lovina Beach on the north coast (see review here) it was a dramatic 3 hour drive south, crossing the entire island, to reach Seminyak - notable both for the beauty of the route, passing through immense vistas of terraced paddy fields, lakes, streams and volcanoes, and also the most dramatic thunderstorms and torrential rain typical of the Balinese monsoon season. A highlight though was stopping at various roadside Warungs (Balinese cafes) for a fix of succulent Babi Guling (roast suckling pig), the local delicacy eaten all over the island. A few kilometres from the capital Denpasar, the south coast of Bali has a cluster of villages which are home to a large expat community as well as the starting or ending point for the bulk of tourists who visit the island. From Kuta, the most southerly near the airport, through Legian, to Seminyak and Petitenget, the atmosphere becomes progressively more upmarket. Kuta is a surfers' hangout, tattoo parlour and Aussie bar town, and a place popular with backpackers and gap-year students. Legian is a little more sedate, and popular with families looking for affordable accommodation near the beach. The next town north of Legian, Seminyak is more elegant (and expensive) with mostly luxury accommodation and fashionable , relatively costly restaurants and bars. The atmosphere is more sophisticated and laid-back, and the beach in particular is quieter during the day. Seminyak is also the shopping capital of Bali with many well known labels on the high street including Camper shoes and Paul Smith among local shops. Petitenget is at the poshest end of this stretch of coastal villages, and hosts some of the best restaurants, art dealers, cafes as well as being the greenest and most residential area with fine villas and apartments. There is certainly a downside to this development and the whole district has become very congested. However, for its range of luxury hotels and excellent restaurants, tasteful galleries, antique shops and spas, there is nothing to rival Seminyak and Petitenget in Bali. With no signs indicating their presence, either on the main roads in the town, or indeed outside their reception, Amana Villas are clearly for those in the know. From the centre of Seminyak's main road, it is via a tiny narrow street that one approaches its almost hidden, unassuming entrance. But passing through the lobby, one finds a collection of fifteen stunning villas nestling among bamboo topiary. A brand new hotel, the design is minimalist, ultra-modern and chic. Each villa is completely self- contained, with its own private entrance, swimming pool and garden. Our villa was a duplex, with an upstairs living and kitchen area (where breakfast was served), downstairs bedroom and bathroom, and private infinity plunge pool whose water cascaded down a waterfall sculpture at the foot of the double bed. It was a very impressive setting and design, all dark wood and natural stone, with plenty of natural light and space. The hotel offers a highly individual butler service, for instance as beds were turned down each evening, lighted tea-candles might be placed in the bathroom with guests names printed inside the glass, or personalised cakes, chocolate coated fruit, or roses left on the bed - each evening's surprise was something different. I was very impressed by the level of service, with some staff going well beyond the call of duty to help us - the manager Arie Santoso spent many hours one evening helping us purchase last minute flights to Lombok. 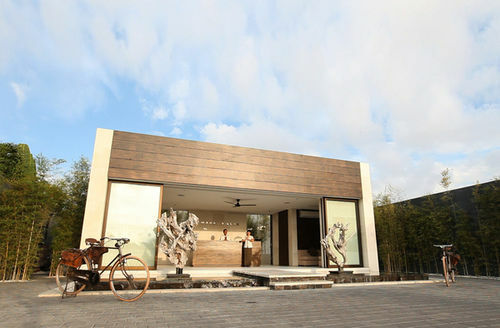 The hotel also offers complimentary access to Bali's premier member's only country club, Canggu Club. Each morning, breakfast is served in the villa by the butler at a pre-arranged time. There was a good choice of Indonesian and western cooked dishes, as well as freshly cut fruit, tea, coffee, cereals, yoghurt and pastries. It was a hearty meal enjoyed to the sound of our own private waterfall. Amana Villas is well located at the junction of Jalan Kaya Ayu ( also known as Jalan Oberoi or Jalan Laksmana ), which has most of the town's restaurants, and Jalan Seminyak, where the antique, art and furniture shops are. Yet, on the 100 metre walk to Jalan Kaya Ayu, there are rice paddies, and the villas themselves are remarkably tranquil, reflecting this distance from the high street. The sky at night is pitch black - great for star gazing during a late night plunge in the pool. There are very few hotels which I feel have got it so right - beautiful, sophisticated and private. When in Seminyak, I can't think of anywhere else I would rather stay. Very highly recommended. A ten minute walk from Amana Villas is Mamasan, a fashionable Australian-owned restaurant with cool decor and purportedly some of the best food in Bali. Converted from a large old warehouse, Mamasan occupies two floors - a large restaurant on the ground floor and a busy cocktail bar and lounge on the first. A beautiful and stylish restaurant, it has high ceilings, some impressive British colonial-style furniture and other vintage pieces and paintings. Mamasan is the "trendy" option in Seminyak with European prices to match. We enjoyed the food at this restaurant but found the nightclub style music and feel of the place a bit discouraging. There is a dress code and diners are expected to dress smartly. Photography is not permitted inside the restaurant, and after pleading with our waitress, the manager, and then the owner, we were allowed a couple of sneaky pics. The menu features dishes from most South-East Asian countries, particularly Thailand and Vietnam, but also has some Chinese and Indonesian options. We started with a refreshing Thai salad of crispy salmon skin and green mango served with sweet fish sauce at £7.50. This was a delicious, zingy and well made salad. The Sichuanese fried cumin lamb at £7 was also good although not as "cuminy" as I tasted in other Chinese restaurants, and the portion was a tad ungenerous. The crispy confit pork hock on the bone served with a Nam Pla Prik sauce at £9 was a triumph. Crispy on the outside but succulent and very soft inside, I just wished I had a bigger stomach to order another portion there and then. Apologies for the dodgy image quality, the pictures were taken quickly and in poor light. The wine list is one the most expensive we saw in Bali with entry, basic level wines at around £40, so we opted for jasmine tea at £2.50 per person (Michelin-starred Hakkasan prices). Annoyingly, our tea was served in two separate Western tea pots and cups which took up nearly our entire table, and unsurprisingly, they were not refilled. Again just a ten minute walk from the Amana Villas, Chandi is another lovely restaurant on Seminyak's main street. An interesting blend of culinary cultures and local know how reflects the influences of the two head chefs, husband and wife Agung Nugroho and Kirsten Weymar, who opened the restaurant in 2008. This is a very elegant and relatively expensive restaurant with both indoor and outdoor dining areas, white table linen, candles and very fine service. We kicked off with a sizzling platter of various fish and shellfish sate skewers at £14 which included butterfish (highly fatty and deliciously rich white fish), black sea bass, scallops, lobster, whole soft shell crab, squid, long beans and lotus root. The fish, including the squid (surprisingly), were perfectly cooked and soft, well seasoned and with a delicious char-grilled flavour imparted by the hot grill. One of the restaurant's specialties is their "Duck Betutu Tasting" at £14 per person which we ordered. The tasting menu included the Balinese 16-spiced marinated crispy duck, sate lilit on sugar cane (blend of duck meat and spices), salty duck egg, long bean, soy sprout and grated coconut salad and 3 types of Sambal sauces. The best dish of the evening however was the roasted pork belly at £9 served with Chinese broccoli, pink grapefruit and chives. The Balinese have a great fondness for pork with Babi Guling (roasted suckling pig) being one of their most famous dishes. Chandi's pork belly was extraordinary, the crackling was fine and very crisp, the meat meltingly tender and flavoursome. This is a dish not to be missed at Chandi. One of the most elegant restaurants in Petitenget, Sarong was highly recommended to us by many throughout Bali. Open since 2008, founding chef Will Meyrick's menu presents dishes he sought out from street-food vendors around Asia. The restaurant has gained a number of international awards, and it was packed on the evening we were there. We started with a perfectly cooked, crispy and well seasoned plate of salt and pepper squid at £5 followed by an exquisite crispy pork belly with baby mandarin and ginger with a black vinegar caramel at £7.50. The pork belly was out of this world (probably double or triple cooked) and the portion was also rather generous, this was by far the best dish of the evening. The Eastern Balinese duck salad with young fern tip, lemongrass and kaffir lime at £5 was the vegetable accompaniment for our curry main. It was flavoursome and with a lovely texture but unfortunately a tad salty. Sarong's Penang curry with wagyu beef at £10 was good but again slightly too salty. The curry sauce had been over-reduced and the flavours were too intense and overpowering. The stir-fried rice with egg, asparagus, shiitake mushrooms and sweetcorn at £3.50 was however delicious and well made. For pudding, Dr G and I shared an Asian dessert of young coconut jelly, crushed ice tapioca, and black agar agar at £3. Beautifully presented and very refreshing, I was very impressed by the combination of flavours and textures in this dessert. Seminyak is the shopping capital of Bali. Suria and Folk Art Gallery on Jalan Oberoi have fine collections of Balinese and Indonesian crafts on sale, and are well worth a browse. We bought a few pieces for our living room there. There are many spas in this area, with varying degrees of comfort and professionalism. After some research, we thought Melasti Spa offered a good balance of skill, privacy and cost. We had the Balinese massage (a mixture of acupressure and oil massage) for 60 minutes, at a cost of £10 per person, and left feeling refreshed and relaxed. Dean’s Bali Cooking School is run by renowned chef Dean James, and offers a number of courses that can help visitors learn more about Balinese cuisine. As well as instruction on how to cook, the participants can get the opportunity to visit a local market and learn about ingredients. The beaches that run along the south side of Seminyak/Legian/Kuta are sandy, and very well known for their surfing. They are also good for a swim if you don't mind being clobbered by metre-high waves every so often. And it is Selamat Tinggal (Goodbye) Bali! Seminyak was the last place we visited in Bali before flying out to Lombok and then Singarpore and London. I fell in love with this Indonesian island, its people, their way of life and above all their food! The video below which I found on YouTube captures how I see Bali, it is definitely worth a watch! If you enjoyed this post, you might like to read my other write-ups on Bali. Room internet rates for the 'waterfall villa' featured are from £236 per night inclusive of breakfast. This would be a great Honeymoon trip :) the villas look incredible! !